James E. Eckelberger, son of John E. and Marian (Francis) Eckelberger of New Castle’s East Side, was graduated from New Castle High in 1956. In 1959, Midshipman First Class Eckelberger participated in an 8 week summer training cruise aboard the attack aircraft carrier USS Lexington, operating with the US Seventh Fleet in the Far East. He received his bachelor’s degree in 1960 from Northwestern University and his MBA from Harvard Business School in 1967. In 1969, Eckelberger received the Navy Commendation Medal for his outstanding professional skill and resourcefulness while stationed at the Navy Supply Depot on Guam. In 1972, he was promoted to Commander. 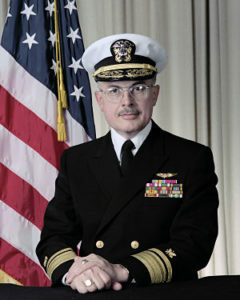 At the time he was serving as the Director of the Financial Division, Navy Fleet Material Support Office. In February 1974, he was awarded the Legion of Merit medal for his outstanding performance of duty as senior adviser to the commanding officer of the Vietnamese Supply Center in Saigon. He then was transferred to the Naval Air Station in Alameda, California, serving as its comptroller. He later became the Director of Supply Operations for the Defense Logistics Agency, which is the largest logistics combat support agency, providing worldwide logistics support to all military. After serving for 31 years in the military supply chain, Eckelberger retired. In his later civilian life, he was Vice President of Pace Membership Warehouse, part of Sam’s club; Vice President of BJ’s Wholesale Club, and Vice President of Global Integrated Logistics Operations for Compaq Computer Corporation. In 2008, he was appointed to the Board of Directors for UDS Group, Inc. Eckelberger was appointed Chief Executive Officer for Netmercury in 2001, and went on to work for Huttig Building Products, a billion dollar distributor in the woods products industry. He was elected Chairman, Board of Directors in 2000 for Southwest Power Pool (SPP) and continues in that position. SPP is an electrical transmission company in the midwest using about $10 billion of electricity annually. Eckelberger married the former Kathleen Howley daughter of Dorothy and Joseph Howley, from New Castle. They have two sons, Todd and Chad, and one daughter, Leah.